Serendipitous. That bests describes the chance meeting we had with Allen, the author of this article. 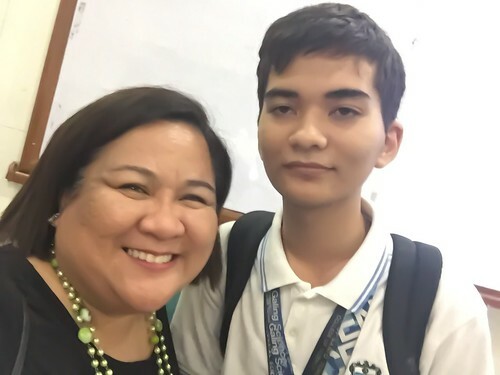 He was among the attendees of the UST LENSES Seminar last 10 April 2015, where ASP National leaders Mona Magno-Veluz and Gina Luna Bermudo were guest speakers. Amid the 200 faces that listened to the autism awareness talk, Allen’s smile stood out -- a smile of understanding, as he was intimately familiar with the sensations and feelings discussed during the lectures. Allen has autism; but as his empowered piece will let you know, autism does not have Allen. Every person’s journey from infancy to adulthood follows a certain pattern of events that happen; a pattern of expectations that one must fulfill; a pattern of norms and mores that one must obey. This is the journey that each parent envisions for each child that is born; but not for my mother. It was made clear to us when I was diagnosed with autism as a young boy many years ago. I was completely unaware of this different pattern that I had to follow until mid-2002 -- that I was different; that a lot of storms awaited the years ahead. I just eventually understood that I had autism and that I couldn’t do anything but live with it. Allen Garcia with ASP National President Mona Magno-Veluz. Once I studied alongside neurotypical children. I was unaware of what I was doing. The storms had begun to rage on. Many new obstacles had popped up. Little by little, most of my peers started to become skeptical of what I can do -- who I am. I can say that my elementary and high school years have been the most stressful time of my life so far. I faced a lot of struggles I never anticipated – this ranged from bullying to social frustration, to failing a whole year of school. My family recognized all this and together, we worked past each obstacle. We stayed the course despite all the skepticism. The efforts slowly began to pay off in the acknowledgements that my teachers gave me. By 2013, I started my applied math program at University of Santo Tomas – a place a lot of the same peers who ridiculed me long to study at. I had friends who had my back – friends who didn’t judge me for who I was. It turns out that this university’s nursing students have now facilitated something I should have done a long time ago – stand up for people with autism ... people like me … people who don’t deserve to be second-class people simply for who we are. As I compare myself to my peers now, I can spot a lot of differences. Yes, I’ve never had a significant other, nor do I live a lifestyle like most youth have. I do not have a lot of friends, nor can I understand social protocols as well as they can. No, they haven’t given much thought about their future, nor have they done much to ensure a secure financial future. They haven’t bothered to find out many things beyond academic matters and popular culture, nor have they bothered to see things without the “groupthink” that society imposes upon all. I can say that the score is even, yes? I can say that I’ve accomplished as much or sometimes more than my peers have. I can say with firm conviction that if I was given a chance to live life again, I wouldn’t change the fact that I have autism. I am thankful that God has cooperated with my family and enabled me to get this far. Yes, I have a lot of work ahead of me. Everyone does. As Facebook’s culture says: this journey is 1% finished. Allow me to tell all of us people with autism and our parents and advocates this: Thank you very much for staying the course. Allen Christian Garcia, 19, is currently a second year applied math student at the University of Santo Tomas. He is currently living with his mother in Marikina City. His interests include mathematics, computing, personal finance and the sciences. Mam/Sir, I would like to quote some parts for my master's thesis which I am currently writing. Writer's name will be changed. Hoping for your consideration and reply. Thank you! Please DO NOT change the name of the writer. Autism is not something we need to hide. We need to acknowledge self-advocates for their insight and talents. Thanks!